Accurately scheduling Parent-Teacher Conferences is both time-consuming and complicated for secretarial and administrative staff. Weeks are spent creating schedules for parents and teachers to meet. First letters and forms are sent home. Then students and parents need to be reminded to select a meeting time. Finally, administration needs to work out conflicting schedules to satisfy everyone's busy itineraries. The result of all this extra work is a logistical headache, leaving everyone overworked, stressed and often with inconvenient or conflicting appointment times. With PTC Wizard's reliable and user-friendly system, the school administration can easily set conference dates and times, specify teacher schedules and location as well as block out specified time slots. Most importantly, administration no longer needs to be directly involved in scheduling meetings. Parents can easily select the available times most convenient for them, with an error-free meeting schedule practically built on its own. To successfully educate students, cooperation between teachers and parents is an absolute must. To this end schools are required to have Parent-Teacher Conferences. However, with parents busier than ever, scheduling meetings with teachers has become more of a challenge. This is especially true when parents face the tedious task of filling out forms, calling secretaries and arranging meetings with various teachers. PTC Wizard directly addresses these issues by offering parents an easy to-use online scheduling system. With full visibility of all available meeting times for teachers and teams, scheduling convenient times becomes a breeze for parents. This secure system also prevents scheduling errors and ensures that conflicting appointments cannot be made. Whether parents have one or more child in school, PTC Wizard's online scheduling will improve parent satisfaction and participation. Parent-Teacher Conferences should be an opportunity for parents and teachers to cooperate in furthering the education of the students. However, when teachers are required to deal with parents changing their appointments and remind those that have not yet scheduled, they will likely feel worn out and stressed by the time the conference rolls around. This all changes when schools use PTC Wizard. With the administration setting the conference dates and times and parents scheduling their own meetings, teachers will hardly need to get involved in building the conference schedule. 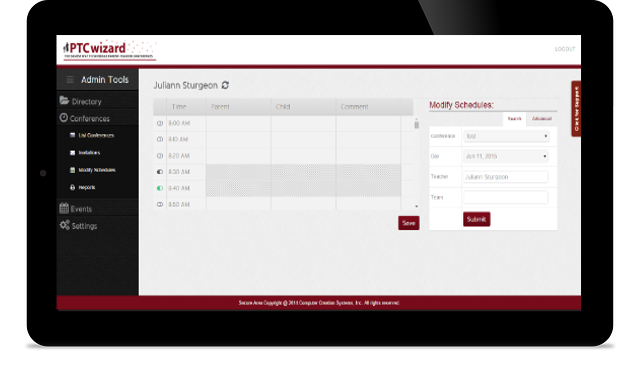 With easy online access to view real-time changes to their personal schedule as well as other intuitive management features, teachers can focus on their real job - educating their students and collaborating with parents.